I’ve been using the virtual pinboard site Pinterest for more than 18 months now and it’s proven to be the easiest way to collect and share links in workshops and during online courses. Links (known on Pinterest as “pins”) are gathered together in my user-defined categories such as Best iPad Apps for Music Teachers, Books I Recommend, Remixing and Film Scoring. On Pinterest, each of these categories is referred to as a “board”. If you have a Pinterest account where you collect music technology links, feel free to share it in the comments section below. It would be good to connect with others! 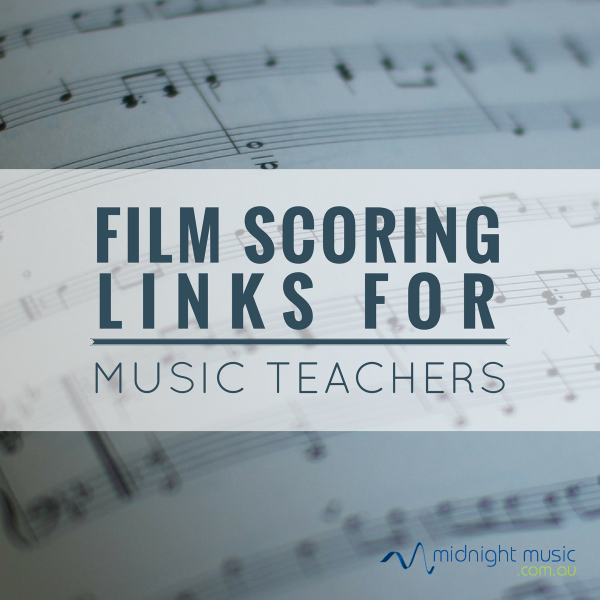 I’ll be highlighting my Pinterest boards on a regular basis and I’m going to start the ball rolling with my Film Scoring collection of links and resources. It was difficult to choose just three, but here goes… You can link on the images below to visit the pin (click on the pin a second time to visit the actual link – the source). If you have a Pinterest account, you can use the Pin It button to add the link to one of your own boards. This is the video I show at the beginning of each film scoring workshop. A great way to demonstrate the effect of music on a scene (and a good way to showcase clever editing). Midnight Music’s pin on Pinterest. The BBC made a series of Wallace and Grommit videos available for school film scoring projects. They have no music, but the dialogue has been left in. You can also download a script and a storyboard to help students with their project planning. Hilarious behind-the-scenes look at a radio show. Useful video for showing students that you may need to think outside the square when it comes to creating sound effects and foley. If you’d like to keep track of what I pin to my film scoring board, click the See It On Pinterest button below and then follow the board with your own account. If you don’t have a Pinterest account, go and get one – it’s free! Follow Midnight Music’s board Film Scoring Resources on Pinterest. Do you have any film scoring-related links to suggest? Do you know of a film scoring link I should add to this board? Let me know if the comments below. Hi Katie, Unfortunately the Wallace & Grommit Films coring project has not been available for some years. There may be another resource that teachers can access more successfully? The Wallace and Grommit resources are still available – just click through to the website from that Pinterest link and you’ll arrive on the downloads page. The page has been “archived” (ie. it is no longer updated by the BBC) but is still there in case teachers want to download the film clips. Hi April – the Wallace and Grommit page definitely has videos on it. It’s the link that ends in MP4. Instead of clicking on it to open it in a new browser (which sometimes just plays the audio portion – I’m guessin that’s what you did? ), you might need to right-click on the link instead and choose “Save link as” or something similar. You’ll then be able to save the file to your desktop. When you open and play it it should show the video.